Gains of Nepal’s land rights movement has come not from bloodshed and war, but from a non-violent social movement. In the larger scheme of things, the petty games that politicians play to keep themselves relevant should not matter much. They have done it year after year, decade after decade — it’s the same plot and even the characters are the same. An impoverished, disaster-prone country should have more things to worry about: climate change, the exodus of the young and able, or a moribund economy. But Nepalis are doomed to be consumed by politics of the worst kind. The collective energy of this nation is spent on who gets to preside over the government and how to unseat the incumbent that is only weeks into its tenure. Everything, including suffering of earthquake survivors due to government apathy and incompetence, is secondary. If it wasn’t for the enormous potential that this country possesses, it would have been difficult not to be enveloped by cynicism and crippling despair. For 20 years a grassroots, non-violent social movement has been slowly sweeping across the country organising the poorest and the most marginalised to live a life of freedom and dignity. It has 100,000 members who are landless, land-poor, former Haliyas, Kamaiyas, Kamlaris and Dalits and they have been spearheading a struggle for land and agrarian rights in Nepal. The National Land Rights Forum (NLRF) has obtained land titles for more than 39,000 landless and tenant farmers, and has played a pivotal role in the introduction of the Joint Land Ownership Policy, helping to establish equal ownership of land for women. 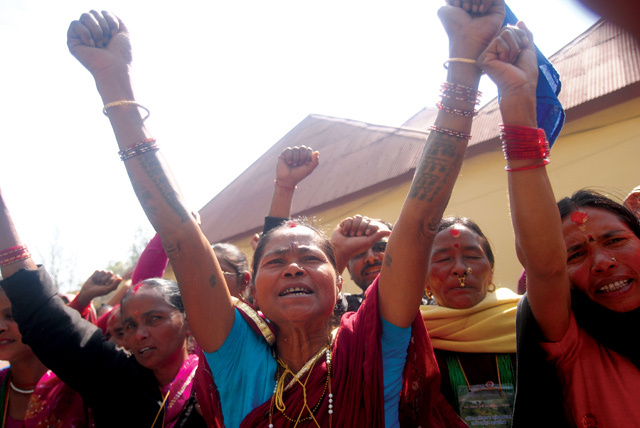 It was a result of a long struggle that culminated in an eight-day sit-in by a thousand landless women in Khula Manch. The advocacy of this group along with other Dalit organisations was instrumental in ensuring inclusion of the provision that guarantees land to landless Dalits in the new constitution. Several progressive land provisions in the constitution, including a stop to forceful evictions, stem directly from the work done by this movement. The Dalit chairperson of NLRF, Lyam Bahadur Darjee, told me recently: “The new constitution uses the exact words we proposed on ending dual land ownership.” In a society where power has traditionally been exercised through control over land, those without land ownership lie at the bottom of social and economic hierarchy. The poorest in Nepal are those who do not own the land they till. Excluding the landless has been one of the ways to maintain Nepal’s unequal power relations. It is no surprise that Dalits both in the hills and plains are predominantly landless. To see a campaign led by some of the most deprived and marginalised communities in Nepal effect policy level changes amidst uncooperative and at times hostile state institutions, proves how powerful and transformatory social movements can be. More than anything else, for me, it was also an affirmation of the power of non-violent action and activism. Full disclosure: I work in an organisation that collaborates with the NLRF, but I witnessed the power of community empowerment with my own eyes. Visiting landless groups in eastern Nepal who have lived without land entitlement for generations and faced constant harassment, violence and eviction by state authorities, I was struck by the extent of the injustices they have faced, and the resolve they showed in improving their lives. The groups have been running agro-enterprises and cooperatives to improve livelihoods, mobilise resources and actively resist land rights violations. Even the poorest families send children to school. Led by women, Dalits and other ostracised groups, the movement has also helped challenge norms of gender and caste. Recently, NLRF contributed inputs for the sixth amendment to the Land Act and is now working to provide feedback for Land Use Policy so that the policy protects the interests of the land-poor. To be sure, there are challenges ahead. Thousands of landless families live in abject poverty, and policy reforms are difficult to implement when many in state institutions and bureaucracy come from landholding families whose interests clash with the landless. Land rights activists are routinely harassed, arrested and have their settlements burnt down. Peaceful demonstrations and rallies are disrupted as the campaign is often perceived to be anti-government. At times it is difficult to run campaigns because most activists are poor and have to work to earn daily wages. Despite this, there is real drive and motivation among members and a belief in their collective strength to influence change. Talking to them, I couldn’t help but think of political parties who have exploited the agenda of land reform to gain popular support. Land Reform was in fact one of the main demands of the Maoists when they launched their armed struggle exactly 20 years ago this week. They conveniently abandoned it once in power. These hard won reforms in land governance have come not from bloodshed and war, but from committed advocacy by a non-violent social movement. Political violence and blackmail have become accepted routes to power in Nepal, but it is only through peaceful struggle and participation in democratic processes that any real social or political change can be achieved. Changes sought by violent means are short-lived and cause more damage than the good they were supposed to deliver. However, social movements led by the land-poor are well and alive in Nepal, as they are willing to take the long but rewarding road to freedom.